Scott Seiver wins the 2013 PCA $100,000 Super High Roller. After over 200 hands at the official final table, Scott Seiver is the winner of the 2013 PokerStars Caribbean Adventure, defeating David “Doc” Sands heads up to earn $2,003,480. In a post-win interview with Joe Stapleton, Seiver credited his comeback to a little bit of run good. The final table began with Sands as the overwhelming chip leader, and in the first seven hands, three players were eliminated. The first player to bow out was Dan Shak, who finished runner-up in this event last year. With the blinds at 20,000/40,000/5,000, Shak opened to 100,000 in early position with . Greg Jensen called on his left, and Seiver three-bet to 275,000 with . Both Shak and Jensen called. The flop came , Shak insantly moved all in for 500,000, and Jensen tanked for a bit before re-shoving. Seiver instantly called off his last 565,000, and the hand was over when the turned, giving him a full house. The completed the board, and suddenly Seiver had over 2.5 million chips. Vladimir Troyanovsky was the next to exit when he open-shoved his last 485,000 with . Nick Schulman woke up with in the big blind, and held as the board ran out . Troyanovsky earned $257,580 for his efforts, while Schulman’s stack shot up to 2.8 million chips. A few hands later, Jensen three-bet jammed his last 710,000 with over an 80,000-chip open from Schulman. The action folded back to Schulman, who called with , and again held as the flop, turn, and river produced . At the beginning of Level 19, Philipp Gruissem hit the rail. Seiver jammed out of the small blind for effectively 1,085,000, calling it a “freeroll” for the German. Gruissem sweated his first card, said it was enough, and called. Gruissem’s was ahead of Seiver’s , but Seiver took the lead when the dealer fanned . Seiver held as the turn and river came , , and Gruissem was out in fifth place ($400,700). For the better part of the next four hours, and for a total of 96 hands, no one was eliminated. There were a few big hands however, including a three-outer by Schulman. Schulman found himself all in and at risk on a flop of holding , and he was crushed by Seiver’s . The on the turn was a big red brick, but the spiked on the river, giving Schulman a winning two pair. 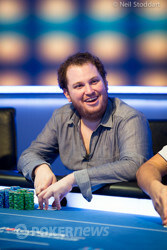 No one doubled more than Cary Katz during four-handed play however – the businessmen somehow won four all ins when he was at risk. In his second double-up hand, Katz shoved for 710,000 with , and the blinds at 40,000/80,000/10,000. Schulman called with in the big blind, and paired his ace when the flop fell . The on the turn was a brick, but the on the river gave Katz a miraculous straight. Katz actually started to chip up, and was second in chips at one point during four-handed play, but was unfortunate in an all-in hand against the eventual champ. Seiver open-jammed his last 1.505 million on the button with , and the blinds at 50,000/100,000/10,000, and Katz re-shoved from the small blind with . The flop was dry, but the on the turn gave Seiver a leading pair of aces. The on the river changed nothing, and Seiver doubled to over 3.1 million chips. Katz was left with eight big blinds. When Level 22 (60,000/120,000/20,000) began, Seiver took the chip lead from Sands, but Sands was hot on his heels, especially after eliminating Katz. In Katz’s final hand, he shoved for 1.35 million with , and Sands called in the big blind with . The fives held as the board came , and play was finally three-handed. 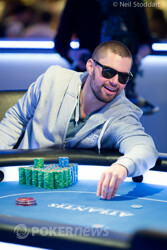 The remaining three players went on a dinner break, and upon returning, Schulman exited in third place. Level 23 (80,000/160,000/20,000) had just begun when Schulman open-shoved on the button for 2.435 million with . Sands snap-called with in the big blind, and flopped a set when the dealer fanned . Schulman could still win with a straight or chop with running clubs, and the turn was the , keeping both draws alive. The river was a brick ( ) however, and Schulman was out in third place. Heads-up play began with Sands commanding 60 percent of the chips in play, and Seiver was willing to make a chip chop deal if Sands was willing to forfeit five percent of equity. He was not. “I’m gonna f***in play ‘em,” Sands told his friend Tom Marchese. The match was back-and-forth until Level 24 (100,000/200,000/30,000) started. Seiver opened to 400,000 on the button with two red nines, David Sands three-bet to 900,000 with , and Seiver immediately went all in for 6.22 million. Sands snapped it off. "As JC [Alvarado] says nines make the most sets," Seiver announced. There was a nine in the window of the flop, giving Seiver a set. "I still feel like I'm going to win," Sands said. He was wrong, the turn and river came , respectively, and Seiver shipped a massive double. A few hands later, Sands moved all in with , and Seiver called with . The board ran out , and Seiver was your champion. Congratulations to Seiver on claiming his largest prize to date and crossing the five million-dollar career threshold all in one fell swoop. For continuous coverage of the 2013 PCA, be sure to stay tuned to PokerNews.com. Scott Seiver has topped a field of 59 entires to become the 2013 PokerStars Caribbean Adventure $100,000 Super High Roller champion. Stay tuned for a full recap of today's final table action. David "Doc" Sands, who began the final table as the chip leader, was dealt a crushing blow moments ago, and Scott Seiver recently finished the job. It happened when Sands looked down at and moved all in from the small blind for 1.865 million. Seiver picked up and made a quick call to put his opponent at risk. Sands was in need of some help, and while the flop did not hit him directly, it gave him a flush draw to any diamond. The turn was not was he was looking for, and neither was the river. 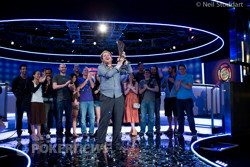 Seiver successfully sweated both the turn and river to capture the 2013 PCA $100K Super High Roller title; meanwhile, Sands finished as runner-up and secured a $1,259,320 consolation prize. "Nines Make the Most Sets"
Scott Seiver opened to 400,000 on the button with two red nines, David Sands three-bet to 900,000 with , and Seiver immediately went all in for 6.22 million. Sands snapped it off. "As JC [Alvarado] says, nines make the most sets," Seiver announced. He was wrong. The turn and river came , respectively, and Seiver shipped a massive double. Scott Seiver opened for 320,000 from the button with only to have David "Doc" Sands three-bet to 860,000 from the big (he only showed the to the camera). "Let's see a flop," Seiver said before making the call. 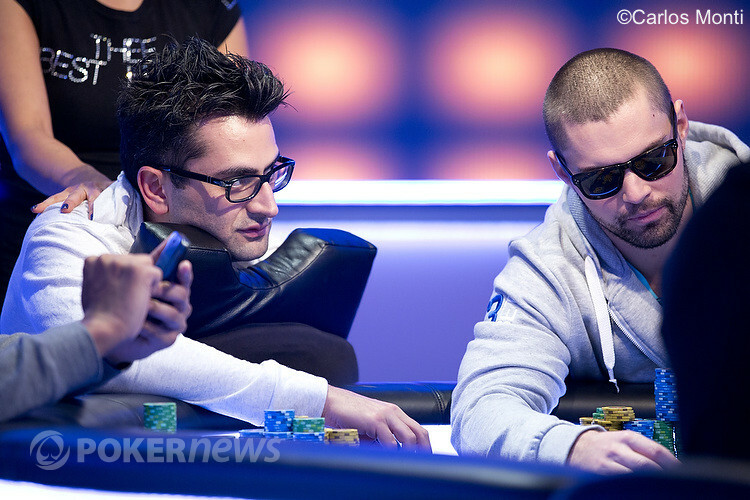 Both players checked the flop, and then Seiver led out for 1.1 million on the turn. It was enough to get the job done as Sands folded his hand. David Sands opened to 320,000 on the button with an unknown hand, Scott Seiver called with , and the flop was . Seiver checked, Sands continued for 370,000, and Seiver quickly called. The turn was the , Seiver checked again, and Sands checked behind. The completed the board, and both players checked. Sands showed , which couldn't beat Seiver's flush.